I am delighted today to be part of the virtual book tour for The Queen’s Vow. This was the first novel I’d read by CW Gortner, and I’m happy to have found a great new (to me) author. 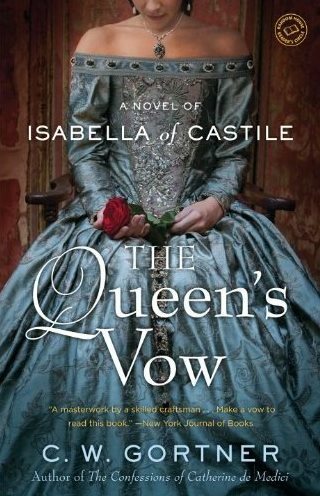 Until reading The Queen’s Vow I knew four things about Isabella of Castile. First, she reigned Castile in her own right. Second, she married her neighbor, Ferdinand of Aragon – an unusual love match. Third, she had the intellectual curiosity, or good luck, to fund Christopher Columbus’ voyage to the Americas. She was the mother of Catherine of Aragon, who married Henry VIII. That was the sum total of my knowledge. It turns out I have missed a great woman, mighty queen and fascinating character — and so probably have you. I luxuriated in the plot, characters and detail in The Queen’s Vow, and finished it with a deeper appreciation and admiration for this formidable queen. Gortner brought Isabella alive, weaving a richly detailed story of her tempestuous life. The novel begins with her exile from the court of her half-brother Enrique and follows her ascension to the throne of Castile, her struggles to unite the Castilian grandees, to create Catholic unity and to defeat the Moors. Gortner’s Isabella is honest, loyal and devout – possibly to a fault. She holds the people around her to high standards, but not higher than she holds herself as the last member of the Trastamara family. Isabella can be a bit arrogant, self-righteous, a little vain, all of which as a reader I could forgive because she shouldered such a heavy burden. Gortner does a particularly fine job of portraying Isabella’s religious devotion – too often in novels this can overwhelm a character almost to the point of one-dimensionality, but Gortner gets the balance just right between a devout woman and a flawed character. Isabella of Castile was a mighty queen and makes for a fascinating main character. This entry was posted in Book Review, Historical Fiction, Renaissance and tagged Aragon, book review, Catherine of Aragon, Ferdinand II of Aragon, historical fiction, Isabella I of Castile. As usual, a masterful exposé! Brilliant! I’d say the devout woman WAS the flawed character. After all, the woman started an Inquisition for her faith because of her devoutness. I must read this author’s books at some point. Totally on my list! Thank you for this marvelous review and for hosting me on my virtual tour. I’m delighted you enjoyed THE QUEEN’S VOW and I hope your readers will, as well.